Dangerous, thrill-seeking sports like rappelling off of cliffs is clearly prohibited. So is skydiving from low planes. On Yom Kippur when every Jewish person fasts, people who are ill are not permitted to do so, because of the risk to their lives. Your life is a precious gift from God that has a purpose in his greater plan, and it’s not yours to gamble with. But what about smoking? Nowadays we know how poisonous this habit is. Hundreds of years ago smoking was thought to be healthy for ones’ lungs, and rabbis of that era ruled that it was perfectly permissible. Many Orthodox rabbis were heavy smokers and some still are. But Telushkin argues that if earlier rabbis would have known that it is a needless risk to human life, they would not have permitted it. So he concludes that even though Jewish law allows it, it is unethical to start smoking or encourage others to do so. Makes sense to me. I laughed out loud. If smoking is wrong, should we just do less of it? I shared that with several Christian friends and it made no sense to them. If something is a sin we should immediately stop doing it, we all declared. It might sound as if Rabbi Telushkin is waffling on the issue – that just he doesn’t want to push too hard. But from what I know of Jewish thought and Telushkin’s other writings, I believe he is saying something more important. His comment actually illustrates a different philosophical approach to the law in Judaism than in Christianity, something we can learn from. The way Christians generally approach a moral issue like this is to say, “Thank goodness I’m saved by grace” and keep on doing what is wrong. Isn’t that how we deal with our gossip and lustful thoughts and occasional lies? We know we’re sinners and can never be perfect, but God loves us anyway. Isn’t that a common Christian approach to living? Much of Protestant Christianity has understood the function of God’s law as to show us our sinfulness, so that we’ll come to Christ for salvation. We read Jesus’ words about “Love your enemies” and we see the rightness of doing so. But following his commands perfectly unattainable for us, so we generally don’t try to hold ourselves to that standard. We just claim “saved by grace apart from works” and go on living our own way. We see laws as arbitrary standards of conduct that simply show how far we are from God, and are glad Christ paid the price for us to not need to worry about these fences that separate us from God’s holiness. The Jewish attitude about the law is very different. Contrary to our assumptions, their discussions on the law are not about earning one’s way to heaven. Jewish thought generally assumes that Jews are already saved because of God’s covenant with Israel. So their debates about the Torah are not about meriting salvation, they are an attempt to describe how to live in a way that pleases God. They see the Torah as God’s ultimate will, the instructions that a loving God gave in order to have life to the fullest. If they can’t follow the Law perfectly today, they’ll do their best to do what they can, and try even harder tomorrow. In the late first century AD, Rabbi Tarfon summed this up by saying, “The task is not yours to complete, but neither are you free to desist from it.” (Pirke Avot 2:21) You may not be able, as a sinner, to be completely obedient, but you cannot give up trying. Smoke less today, and try to quit tomorrow. What is ironic is that this idea is the opposite of the legalistic stereotype that Christians have given Jews. We assume that if you spend time meditating on God’s laws, you’ll be harsh and unbending on how to live them out. But because Jewish thought devotes so much energy to how the Torah applies to all of life, over time it has developed a patience and realism about what people can do and what they can’t. People are encouraged to keep aiming to live up the ultimate standard, even if they aren’t able to do so today. I’ve grown up in a tradition that has emphasized the overwhelming dangers of legalism, tying salvation to righteous living. But we’ve under-emphasized the opposite danger – falling into lawless living after coming into a saving relationship with Christ. We can become useless disciples that never bear fruit because we’re so unwilling to conform our lives to God’s will. If you can’t stop gossiping altogether, gossip less today. If you can’t be perfectly kind to other people, aim to be less unkind today. If you can’t be perfectly honest, keep yourself from lying today. And try again tomorrow, asking the Lord’s help, to do even better. * From The Book of Jewish Values: A Day-By-Day Guide to Ethical Living (Bell Tower, 2000) by Rabbi Joseph Telushkin, pp 51-53. The quote from Rabbi Nachman is found on p. 2 of the book. Note: This is one of my all time favorite books. I spent over a year reading through it with a study group and our lives were changed. I highly recommend you get a copy at Amazon and work through it with some friends. This is such a wonderful article. And, as a Salvation Army officer, it is very relevant for me. I will definitely use your work in this article to benefit others who struggle with whether or not smoking is okay for Christians. As a Salvation Army officer, I have made a committment not to drink any form of alcohol or use any type of tobacco. What’s interesting to me about this covenant, concerning the alcohol issue, is that there are many people whose stress levels are so high that they are forced to take prescription medications, when a simple glass of wine may be all that’s required. Is it better to take anti-depressants or anti-anxiety drugs than to drink wine? The Talmud teaches, “At the head of all medicines am I wine; where wine is lacking drugs are necessary” (B.B. 58b). And the other issue has to do with the commitment not to smoke. There are many who abstain from smoking but eat to the point of morbid obesity. This is truly a difficult ethical dilemma for the church. Thanks again for your wonderful and helpful research. Lois, thanks for the incredible article. Johnny, thanks for your comments and for leading us to this site. As a Salvation Army Officer, I find your questions on how we allow some things and not other to be a conversation that the Salvation Army should march into. Thanks again for your thoughts Lois. I look forward to reading other articles. I’ve lived this teaching. Please let me share what Jesus did for me! 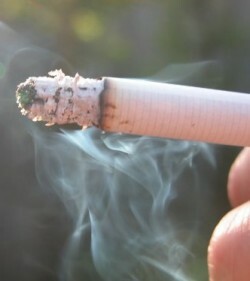 I was a committed smoker, having begun the habit in my early teens. On 8/19/85, after 43 years as a church-attending unbeliever, the Spirit of God compelled me into the Kingdom, and things began to change, some more quickly, some more slowly. Early-on in my faith-walk, the Spirit led me into His Word on a daily basis, each morning. When the weather permitted, I would take my morning cup of coffee, my Bible, and my cigarettes outside for my quiet time with Him. In June, 1990, the Spirit advised me that He wanted me to quit smoking. I readily confessed that I was too strongly addicted to the aspects of the habit, and that I couldn’t quit. The Lord advised that I could quit, and that He would help me. He told me that every time I got the ‘urge’ for a cigarette, to let HIM know and HE would take it from me . . . so I did! On that first day, I’m sure I called on Him a thousand times to take away that desire for a puff, and He did, each time. The second day, I called on Him just as often, and He came each time I called to take away that desire for a puff. Then the desire only came about 999 times . . . then 998 . . . then 997, etc. . . . until finally the desire was gone. Just as my coming into the Kingdom on the evening of 8/19/85 was the Lord’s idea and timing, so was my stopping the cigarette habit. I sometimes wish I had noted the exact day, but I didn’t. What is more important than the date, was the fact that He did it for me at a time of His choosing. Scripture teaches us in so many places of things that are done according to the Lord’s timing. These are all demonstrations of the sovereignty of our God, our Lord, our Savior! Thanks for the article. I have to confess something. My husband and I are helping a young man from our city go through long-term rehab for alcohol and drugs. He is in another city and doing well. On our fist visit with him, I asked his director what I could bring him. He suggested cigarettes since he smoked. I commented that I wouldn’t buy cigarettes for him. I later felt really guilty for the arrogant attitude I had. That young man is going through a hard time right now, and if smoking helps him to get through it, then so be it!!! If he needs to quit smoking, that can come later. I sent him some money to buy cigarettes. Oh, we can be so judgmental.